The Ebola outbreak in West Africa, which has swept through Guinea, Sierra Leone, Liberia and Nigeria, has killed nearly 2,500 people since it was first identified in the region in December 2013. But when the Ebola virus hit the coastal city of Monrovia, Liberia, it sent crisis responders into a new level of panic. Ebola has never before hit as densely populated an area as Monrovia with such force. While Ebola was only first identified in the city in June, the county where the capital is located now accounts for nearly 40 percent of the deaths in the country. Of all the countries now dealing with Ebola, Liberia is now in the worst condition. The virus first entered the country in March and three months later hit the capital city, spreading quickly and threatening to infect large numbers of people. 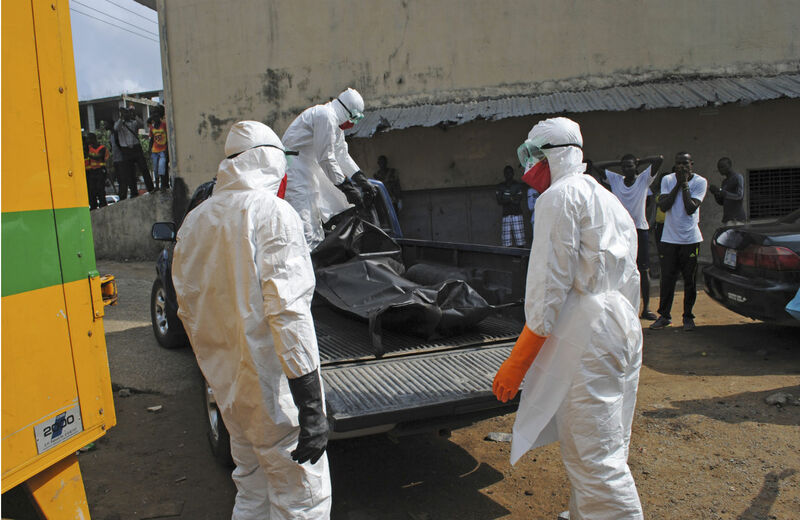 Sierra Leone and Guinea have managed to keep cases mostly to the rural areas and Nigeria was able to quickly quarantine the small outbreak in Lagos. But in Monrovia, the virus is still uncontrolled. The city has become the “worry of the world,” says Andrew Hoskins, Medical Teams International country director. One of the reasons that Liberia is facing a more acute crisis than its neighbors is that high levels of corruption have created widespread distrust in the government—undermining its efforts to contain the virus. In Monrovia, as in other parts of the country, denial and community resistance greeted the government’s efforts, meaning that early Ebola cases in the city were difficult to identify and follow-up with, Hoskins said. “Distrust in the government was a big part of why [Ebola] exploded,” said Liebrecht Lierman, country director of African Development Corps. When Ebola first appeared in Liberia, many of the people in the country thought it was a scam crafted by the government to attract funds from international donors. This meant that Ministry of Health messages on precautions to avoid transmission fell on deaf years. Coupled with a culture that values close interactions with friends and loved ones and beliefs that medical ailments can sometimes result from “juju,” a kind of voodoo magic, residents’ mistrust of government has carried Liberia to its current state of crisis. One morning in July, Satta Watson woke up to see about 150 people standing outside of the window of her home in Monrovia. Seven people had died in her neighbor’s family across the street in the previous month, but many community members doubted that Ebola was the cause of the deaths. That morning, the community gathered to prevent representatives of the Ministry of Health, accompanied by local politicians, from taking away another ill neighbor. Watson, like many other Liberians, initially believed that the government was exaggerating the outbreak for political reasons. “I was hearing people tell me that what was happening wasn’t Ebola, that whatever it was had been created in labs as an effort to kill Liberians,” she said. “That it was a way the government could get money from the World Health Organization so that it could then put the money in its pockets.” Now Watson accepts that Ebola is in the country—but doesn’t trust that the government is handling the response effectively, or even properly identifying when people have Ebola. Pandora Hodge, a project coordinator for a local student group, said that through doing outreach, her group has learned that “some people don’t believe that Ebola virus really exists or is even killing our people.” In rural areas, her organization is finding it difficult to convince people to heed prevention messages from the government, such as to avoid playing with monkeys, eating bush meat and eating fruit that could have been contaminated by bats. Families have hid infected Liberians rather than bringing them in for treatment; some women lie and say they recently had an abortion if they are bleeding. Others simply ignore their symptoms until they collapse, said Hodge. But the ghosts of the nation’s past soon began to haunt her administration. In 2009, the Truth and Reconciliation Commission of Liberia recommended Sirleaf be forbidden from holding public office for thirty years because she previously backed Charles Taylor, the guerilla leader responsible for many of the atrocities committed during the war. Sirleaf remained in power. Her fellow Nobel laureate, Leymah Gbowee, resigned from her role in the commission and publicly distanced herself from the president in 2012. The consequences of corruption have ravaged the nation in the past. A report released by the International Crisis Group in 2011 found that 63 percent of Liberians see corruption as the root cause of the two civil wars that broke out between 1989 and 2003. As Liberia struggles to contain the Ebola virus from spreading, years of broken confidence in the system weigh heavily on its efforts. Many Liberians also take exception to the high levels of compensation these appointments receive—for example, Sirleaf offered former Auditor General John Morlu the post of minister of finance with a salary of $32,000 per month, as well as benefits—when 64 percent of Liberians live on less than a $1 per day. (Morlu turned down the post.) While Morlu’s case offers a look into the salary of a high-level minister in Liberia, in general minister salaries are not public information, said Winsley Nanka, the deputy auditor general for the General Auditing Commission. Government officials also get other perks. A traveling government official receives a daily allowance rate of £520 in London, $449 in New York City, and comparable rates in other cities, which they can pocket if they don’t spend it. Many officials spend large chunks of the year traveling, Nanka said. Heading the board of a public corporation is also lucrative for a public official. A minister could make tens of thousands of dollars in compensation per year from heading several boards, said Morlu. Liberians also resent that officials with close ties to the president act with impunity, say transparency experts. There are few investigations, few firings and too many promises of prosecutions that never actually happen, said Doe Nah. A scandal in the timber sector provides a recent example. Global conservation groups consider Liberia, which holds about 40 percent of West Africa’s tropical rainforests, one of the world’s hotspot of biodiversity. But in 2012, a group of advocacy organizations revealed that over the course of two years, the Liberian government gave away one-quarter of the nation’s land to private companies in a series of illegal logging permits, based on improper, and in some cases falsified, documents. The signature at the bottom of these permits belonged to Florence Chenoweth, the country’s minister of agriculture, or her deputy minister, under her instruction. Despite an independent investigation finding Chenoweth, among others, culpable, she has not been held responsible. A good friend of Sirleaf, she is considered one of the president’s “untouchables,” according to Hassan Kiawu, a former director of communications for the minister. And Minister of Justice Christiana Tah is Chenoweth’s first cousin, according to FrontPage Africa. The General Auditing Commission, an agency intended to serve as a government watchdog, has produced more than ninety reports implicating current or former government officials in wrongdoing. Some of the audits show bank accounts with millions of dollars unaccounted for and the presence of “ghost employees”—names on the payroll of individuals who are dead, or who no longer work at the ministries. But the Ministry of Justice has not moved forward with any indictments as a result of these audits, said Nanka. Food security is also a concern. Liberia, a country rich in fertile land and resources, cannot feed its own people. More than 60 percent of food items consumed in the country are imported, which is higher than neighboring countries, according to the United Nations World Food Programme (WFP). Critics say that the Ministry of Agriculture’s budget—$94.8 million in the previous fiscal year—has been mismanaged. Restricted travel in-country and the closure of the borders with Guinea and Sierra Leone borders has made food scarcer, said Adama Diop-Faye, WFP country director for Liberia. As citizens engage in “massive panic buying,” stocks have been depleted, pushing up the price of food even further, she said. Years of mismanagement has left Liberia ill equipped to shepherd the nation through a crisis of the current magnitude. The health system is falling apart. When the outbreak began, Liberia had only about one doctor to treat every 100,000 person, according to the World Health Organization. Health workers, who have, according to the Ministry of Health, accounted for 8 percent of all Ebola cases and 6 percent of all Ebola-related deaths in Liberia, are scared to come in to the clinics. And some health workers have claimed that the government is not sending their paychecks on time, said Aimee Summers, an epidemic intelligence service officer for the United States Centers for Disease Control and Prevention. As the death toll mounts, residents are more willing to accept that Ebola is in Liberia, say health workers. But even if the government can get over Liberians’ mistrust, they still have to overcome perceptions of incompetence. The government has been slow to respond to the national hotline to pick up Ebola patients and dead bodies, say health responders and community members. Dead bodies, which are at their most infectious state, sometimes are left at homes for four days before the burial team arrives, said Hoskin. Some neighborhoods have had to set up roadblocks to draw attention to Ebola victims. Editor’s Note: This post has been updated to reflect the number of victims of the current Ebola outbreak, as of September 16, 2014.